Jack Wood for race results. The HoM awards went to Shirley Wood, and to the members of the Ladies Horwich 5K team (Jane Bryant, Sally Morley, Jann Smith). Congratulations to them, they will receive technical running shirts from HoM sponsor UP & RUNNING. Adrian Hall (Mk I) reports ... an undulating and dusty 10 km trail race through Swinley Forest on a very hot evening. Well organised by 209 Events; part of the 2009 Trail Series. Andy Wiggans reports ... Seemed to be a few Ilkley types at this traditionally sunny, and worryingly bumpy sportive. Me and Andrew "The Herb" Herbert were doing the medium route of 130km (or 81 miles for anyone watching in black and white). With my new svelte figure and Ultegra equipped bike (thanks to my "chain in wheel" mishap the other week I managed to sneak a few cheeky upgrades in at repair time) I had my eye on a silver standard of 6:15, with an unspoken distant possibility of gold at 5:25. Gold lasted about 8 miles when my back tyre went pop just after Fewston, but I managed to get it changed in under 10 minutes and set off after silver (and The Herb, who I'd told to crack on in my best Scott of the Antarctic voice). Following an eyeballs out chase to Greenhow, during which I saw proud dad Neil Chapman waiting for his lad who looked to be going really well when I saw him, I caught The Herb, and we pressed on to Grassington for energy juice and flapjack. Our time to Grassington was the same as last year - despite the puncture. Heading up Littondale I realised something was odd about my bike computer - it was calculating the average speed including stops rather than just moving time - which meant that our 14.7mph wasn't that far outside 15mph (gold standard) despite the stop, so we pressed on a bit over to Malham. During the climb from Halton Gill we got separated, so after stopping in Malham for 5 minutes or so I started to get anxious about the average speed which was quite literally dropping before my eyes, so left before The Herb arrived. The section over to Hetton and down Wharfedale passed ok, but always with Langbar looming after it - and even with my best efforts I still couldn't seem to make any headway into the required speed to hit my standard, meaning I had no slack at all. Langbar felt really hard, and I hit the top with about 20 minutes to get back to Ilkley within 5:25. I hammered it down the hill, and was just starting to relax after I turned off Carter's Lane onto the Denton road when my bike computer flew off. A screeching halt, some choice words and a mad dash back to the sports club, and I "dibbed in" at 5:21:08, 4 minutes inside gold and enormously chuffed. The Herb arrived an inordinately long time later, having missed the turn to Thorpe and carried on in the wrong direction going back UP Wharfedale, only turning round after a brief tour of Grassington and a second visit of the day to Kilnsey. He doesn't wish to talk about the time (but suffice it to say he'd have smashed Silver standard if he'd gone the right way). All in all a great day out, with brilliant organisation (apart from the signs at the Thorpe road not being quite billboard-esque or illuminated enough for the visually challenged Herb), a beautifully scenic route and some gnarly lumpy bits. Bob H has spotted the results are up ... names I recognise, including some retired members. I feel they should be remembered. I think the DM must be our old DM. The age and time seem about right. Great to see so many members (and retired-from-running ex-members) out on the White Rose this year. I promised No.2 son I would ride with him this year, so I went around the short course early doors and caused a few problems by arriving back while people were still going out! I recorded 2.51, but it was a while before they could find a time-station to dib me in! Great rides from Kelly, Jo and Andy in particular. It seems a little harsh that the ladies have to go for gold by the same standard as the men! Well done too to young Bradley and old Paul. I think our webmaster might be finding a new lease of life. It's got to be silver in the 130K next year. And then gold!! Great to see Dennis out and still clearly very fit. Remarkable that he managed to split Jo and Jim. I'm pretty sure they didn't ride together. Stuart must have a story to tell! Major mechanical or majorly lost? You were flying when we rode together a few weeks back. Let's have some more reports and encourage an even bigger turnout from the club next year. It's a fantastic event to have on our very doorstep. Jo Foster adds ... It was a great ride and very well organised. Jim and I rode round together, never seeing Dennis unfortunately (see Bob's report!). A bit unfair that I was a few seconds quicker than Jim becuase he could have gone a lot quicker, kindly waiting for me as we'd agreed we'd ride together. We caught up with Kelly at Malham who was feeling good, rode with us for a few miles and then disappeared into the distance - great ride Kelly! We also spotted Bob coming back in the other direction! Great to be able to do a sportive from home and my the first one where I've managed silver standard instead of bronze! Good Etape preparation. We've just worked out that the same distance will take us to the foot of Mont Ventoux in 3 weeks time - ouch! Graham Arthur reports ... Another extended navigational challenge (low cloud), like Jura, but without quite so much wind, and no rain, yet a much higher attrition rate. For a good brief description of this sixth in the Scottish Long Classics series, also a counter in the SHR Champs, click SHR report. My multiple reccies and two times racing of this course over the last couple of years paid off, and, unbelievably, I never got lost. There was a moment of despair when I realised I had dropped my compass early on in the race. Fortunately I had an altimeter, and spot heights plastered all over my map. Vic Verecondi reports ... A new era time has arrived in the Verecondi household ... as of tonight my son Luca holds the "record" for a 5km race ... this came about through a 5 km time trial tonight staged by Keighley and Craven AC. Luca and other juniors were running in the event. The course was quite tough, the route being a 300 foot climb on road up to Jubilee Tower staring at Greenhead School and then back. Basically 2.5km upwards, turn around 2.5km back down. Anyway my time was 21.58�. Not bad I thought... I was delighted to see Luca (12 years of age) obtain a time of 21.28 Fantastic effort. His training has been very good and it seems all those extra sessions on Saturday mornings on Ilkley Moor have helped also. Thanks very much to those who organised the event for the juniors and also for making me very welcome, it was a most enjoyable evening. Wendy Hutchinson reports ... I did the Cancer Research 5k at Harrogate Pavillions and my time was 26.27 which was another PB for me. Jim Eden reports ... part of a 9 race series, 4.25 miles, 550ft of climb. Torrential downpour and thunderstorm all race made the three river crossings interesting and flash flooding meant that you were knee deep in places. All good fun. Morgan reports ... Another poor run by me in the Helm Hill BOFRA race on Sunday afternoon in muggy conditions. Dave Cummings had a great run to place 15th. A decent course, if a bit fast, with short ups and downs. I wouldn't call it a cross country course, but I wouldn't call it a typical BOFRA course either! Photos on David Brett's site. Don Macrae reports ... certainly lived up to Pete Bedwell's promotional sell of being friendly, well organised and a good course. I managed to sneak under the two hour mark in 1:59:51 as the only Harrier on the result sheet. However, there was also Mr Lonergan doing his 100th. H.M. (86th. in 1:34:27) accredited to Sale Harriers. Same coloured vests? Graham Arthur reports ... with some bigger-name events on this weekend Settle Hills was a very pleasant and low key jaunt round Attermire. Ilkley ladies were 2nd team overall to Hallamshire Ladies and 2nd V35 team, so silver medals all round. Jim Eden reports ... 4 miles, 700ft of climb, from the Hare and Hounds Pub, Chiserley, nr Hebden Bridge. Final event of the Midsummer Madness 3 day event. After a brief shower it was a lovely evening with a hard race amidst beautiful scenery. The team results were affected by the relatively low turnout to this distant event, but there were some great individual runs. From Graham Arthur ... on the basis that our SuperVets (M/F 55+) are only just behind Swaledale, who naturally had a very good turn out at Richmond, and that Otley is a long way for THEM to come, we could clinch this one with a good turn out on Thursday 2nd July at Otley. Four Ilkley Harriers travelled to Kettlewell to run a five mile, 1800 ft of climb fell race organised by Abbey Runners to celebrate their 25th anniversary. A well organised event including soup and roll in the Bluebell afterwards. Well worth doing if Abbey Runners do it again next year. Morgan Williams reports ... Short and steep with 2 crossings of the River Wharfe. Nice sunny day, bite to eat and an ice cream afterwards. Well done to Jenny for keeping her run of seconds going! Graham Arthur reports ... Glorious conditions for the inaugural race starting and finishing at one of the Highlands� most scenic locations. This is the fourth race in the Scottish Long Classics series, and I have now been lapped by Brian Marshall, so embarrassment at being in the lead purely by dint of having done three races as opposed to everyone else�s one or two is over. The winner was Andy Symonds with a few stars not far behind. I�ll say no more, so read the organiser�s report and salivate. Andy Wiggans reports ... a first time for me and my chums, Sean Murphy and new member Richard Hinsley, so none of us knew what to expect apart from some lumpy bits. In the end the lumpy bits were a bit less lumpy than I was expecting, about the same as Sean was expecting (well he does live in Otley) and a bit of a shock for our Richard. As usual I saw Nick Richardson bounding off into the distance and settled in to run my own race. All those sessions on a pan flat track have obviously been well worthwhile as I seemed to pass quite a few people on the hills. As you'd expect for a hilly course that's definitely "not a PB course" all three of us got PBs - mainly on account of this being our first ever 10 miler (Rich and Sean) or first for yonks (me). In the end I crept into the top 30 in 28th place with 64:10 (PB by something over 4:30), Sean had a great run in 69:03 to be 71st and Richard, despite his surprise at the general hilliness of the hills, ran 72:30 to be 117th. This is an amazing performance for a bloke who was turning round after a mile and a bit of our lunchtime runs in late Feb as he was worried about getting trapped the wrong side of Bingley 5-Rise Locks and not being able to get back up! 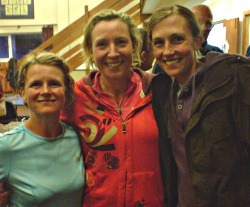 Photo: Terry Lonergan's snap of the Ilkley ladies who won the team prize: Sally Malir, Jane Bryant, and Kay Pearce. Great result! Alison Eagle reports ... Although I am not concentrating on these this year they are still great low key events, friendly and well organised, with food and lots of prizes after each one. Using them as training runs, I was a little diappointed with my outing at Walton. Very hot conditions and my badly timed final push, due to a lapse in memory about where I was in relation to the end, left me in 4th overall, 3rd Vet45 in 38.38. At Pudsey, once again in the rain just like Stretton, on a muddy woodland course (great) I had a better run and finished 3rd overall and 1st Vet45 in 37.24. Ilkley once again BEAT BINGLEY in the annual Mob Match on Bingley's home turf at the Bingley St. Ives Trail Race! Hurrah! 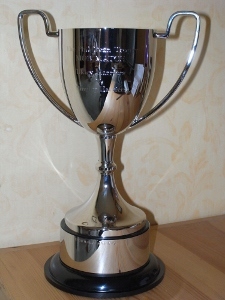 So Ilkley's name will be inscribed again on the super 12" cup purchased from the legacy left by Phil Dean. A few photos of the start here, and lots of race photos on woodentops.org.uk..
Read Dave Jepson's report here. Andy Wiggans reports ..."Bike - check, running shoes - check, wetsuit - check..." is the normal kit list for one's first triathlon - but our very own Vic "The Handy Dandy" Verecondi has apparently added some male grooming items and a mirror. Nothing else can explain the extraordinary amount of time he spent in the transition from the swim to the bike at the Wansbeck sprint tri up in Northumberland today. Looking down the list most people seem to be between 45 seconds and 2 minutes. Vic? 6:39. I can only assume he was drying his hair and ironing his bike top. Anyway - me and Britain's best/slowest dressed man set off outrageously early this morning to get to Ashington, about 15 miles north of Newcastle, for our first open water sprint tri (750m lake swim, 23km bike and 5k run). As newbie triathletes we were in the first wave to set off, along with the people wearing armbands and rubber rings. I had never swum in my wetsuit before, and Vic had only done a few lengths of Ilkley Lido, so we were both reasonably pleased to just survive - I managed 17:48 and Vic 20:22 - both way off the pace of proper swimmers but far from a disgrace. I whizzed through T1 (as we triathletes call it) and Vic presumably met up with his "gentleman's gentleman" to be dressed and have his hair done. The bike was quick and flat, and I'm grateful to Paul O'Looney for the loan of his posh back wheel to mean I had a complete bike with which to go and do battle with the torrential rainstorm which now ensued. I passed a few folk out on the bike and came into T2 in the lead. Vic, clearly concerned more with sartorial elegance than speed, opted to go slightly slower but posted another respectable time. The run was two laps of the swim lake, and due to a watch malfunction I had no idea how fast I was going, but I didn't get passed by anyone so finished the first of the rubbish swimmers in 1:20:53, which is well inside my target of 1:30 - the results show I did 20:30 for the 5k, so not blisteringly quick but ok. Vic came in 1:43:17, but having shattered his transition PB, taking a mere 2:30 in T2, helped by not bothering with the "running specific socks" (no, I don't know what they are either) and Harriers vest he had brought along to change into. My feelings of elation at having beaten a bunch of non-swimmers were shattered by the publication of the results, as I ended up 32nd on overall time out of 134 (which to be honest I'm still pleased with for a first go), and Vic was 119th. The winner was a bloke called Alan Copland in 1:07:00, but he cheated by being good at swimming. Last weekend a small, but some would say perfectly formed, group of Harriers travelled north to Scotland to take on the challenge of the Lowe Alpine Mountain Marathon (www.lamm.co.uk). This was my first LAMM, and my partner in crime for the weekend was Heather Dawe, who was returning to the event after a couple of years of concentrating on shorter, easier challenges such as the Bob Graham Round. The forecast for the weekend was for freezing temperatures and wintery showers so it looked like we might be in for a tough time at the hands of the usually clement and welcoming Scottish weather. As it turned out, Saturday brought a cold wind, but largely dry conditions, save for a few short showers, and Sunday was gloriously warm, hot even. Visibility all weekend was generous, and the views were endless. The terrain was pretty good underfoot, but the climbs and descents ensured we didn't have things easy. Day 1 saw us traversing, and criss-crossing the stunning Five Sisters of Kintail ridge, before eventually heading through Glen Affric and passing Britain's most remote youth hostel. Day 2 was the more runnable day and we moved well, but those climbs still weren't getting any smaller! Eventually, after a weekend total of 16:45hrs, we finished 13th overall in the Elite, which brought with it my first Elite completion in one of the major mountain marathons. Also on duty were Nicky Jacquiery & Joyce Marshall in the B Class, who we bumped in to in the middle of nowhere on Day 1, and Kevin & Rachael Gooch who were in the Score class. Ex members Dan Goodey & Phil Lincoln-Jones were also doing the Elite course, and I did see Ken Jacquiery enjoying a well earned Wilf's at the end too. Apologies if I've missed anyone. Steve & Gaenor Coy report This weekend must have been the weekend for first time Open Water triathlons reading of Andy and Vic�s escapades in Northumberland. We spent the weekend in Rother Valley and joined 100s of others competing and watching in various events from under 9�s Scootathlon�s (which both our boys took part in but with their running heritage managed to run 2.5k for the first leg rather than 400m along with a large number of the boys field due to marshalling incompetence) to the disabled national triathlon championships. Later on the Saturday, when the weather had cleared up, Gaenor took part in her first ever triathlon and in open water (other than a brief dip in Ilkley lido in a wetsuit) as part of a women�s only event - 200m swim, 10k bike, 4k run - and pulled out a fantastic performance coming in 16th in a time of 50:43. The winning time was way ahead of the rest at 40.40. On the Sunday after a ridiculously early start I took part in the �sprint� distance event - 750 swim, 25k bike, 5k run - and was really happy to coming in 19th in 1:24:09 out of 170 (winning time was 1:13:28) in particular with my swim of 13 mins and a 18.36 5k run, despite having a curled up insole in one shoe and energy gels in the other (which I could not feel due to numb feet) however due to these school boy transition errors I am paying for it as I have no skin on my heels � maybe I should borrow Vics run specific socks next time (but he can keep the grooming products).. Anyway a great event and despite the bad weather on the Saturday morning a nice family weekend out which we would both recommend to others for next year. New member Wendy Hutchinson reports on The Two Castles 10k, Run Warwick Castle to Kenilworth Castle. I finished in a time of 57.14, a PB by 11 minutes. I am very very pleased with my performance even though it not a fast run for most of the members at Ilkley but for me was a huge improvement on my last 10k run this time last year and I was also suffering from jet lag. Alison Eagle reports ... Apologies for this belated report for Stretton Hills but I have only just dried out. Arrived on the Friday for a weekend in the Shropshire hills in the rain and left on Sunday in the rain. In between yes it rained, and rained! But that should take nothing away from the Stretton Hills Fell Race, a course designed as a one off for the championship, only finalised the week before- and just a short at 5.75m, 2,500ft. The race started at Carding Mill, owned by the National Trust - who were very accomodating hosts. They lit the log fire and made no fuss about wet, dirty clad fell runners changing in the toilets and taking over the cafe (mind I think fell runners and followers were the only ones out that day and certainly bought our own weight in drinks, soup and cakes!). Th course went out into the local hills, lovely to run in, inlcuing steep short ascents and steeper very wet, soggy downhills. Although a marked course it was difficult to spot the flags at times in the rain and the mist, but was excellently marked out and marshalled. In separate races mens and ladies races the Ilkley Ladies were out in force with 7 runners, and all were needed to claim first team place in both the Ladies, by just 4 points, and vets Ladies competitions. This places us in joint first place in the English Champs with Calder and ahead in the Vets with 2 wins out of 2. Once again as at Fairfield the Ilkley Ladies battled it out amongst themselves, though further down the field overall, all within 34s of each other! Holly Williamson this time the first Harrier in in 15th, followed by Helen Ilsley, 17th, Alison Eagle, 18th, and Emma Barclay, 20th. But still the red and green vest flooded in with young Jenny Dybeck in 22th ( a big step up from her U/17 races previously and a little tough she admitted afterwards!) and Alison Weston, 25th. Alison Bennett completed the team in 41st, beating Calder's third counter and ensuring Ilkley Ladies of that important first place. After an hour's wait, the men set off just as the Ilkley ladies began to arrive at the finish! Unfortunately Ilkley men were in short supply but good results from those who did make the trek down. Unfortunately there was little support as they finished as the bad weather continued and the ladies were still warming up in the cafe! A well organised friendly event, in a lovely part of the country. It was a shame that numbers were low. I will cetainly be happy to venture down again but hopefully with much better weather conditions! Ewan Welsh reports ... 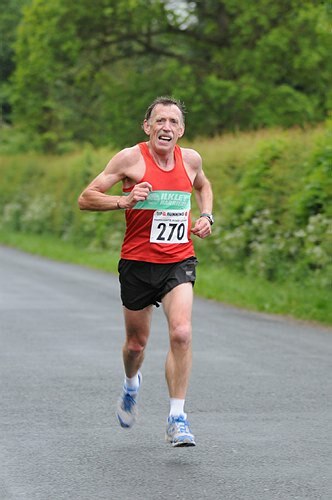 Myself and Mike Baldwin kept each other company around the Wharfedale off road marathon on Saturday. Keeping in mind the not so well known saying of 'don't let the first mile dictate your last mile' we started off at a steady pace and basically kept that steady pace for the duration, we came in on 3 hrs 47 mins, no idea of the results yet. I was delighted with my run, haven't felt that good since the Archie Gemmil goal in the 78 world cup! The route takes in (from Threshfield), Kettlewell, over to Arncliffe, up to Malham Tarn then back down to Threshfield. It's an excellent route, a friendly low key event, tea and buns at the end plus a shower, magic. I would recommend the race (for what my recommendation is worth) and put it on to your top 5 races to do on your doorstep list (if you have such a list). Lots of Harriers doing the 1/2 marathon route, heard John Sinclaire's name mentioned over the speaker as I was basking in a shower, no idea what he won, or maybe he had lost his car keys and somebody had found them, we shall await the results. Amanda Panaby reports ... same route as the Wharfedale Off Road Marathon but setting off 2 hours earlier at 8.30 am. Wind and rain was the order of the day, finished in 6 hrs 13 min 55 secs. From Chris Matthews..... as part of her role on the Bradford Athletics Network Shirley requested a representative from the club to attend the launch of the Bradford Marathon, I was eager to find out the details of the marathon so attended the event last Thursday afternoon in Centenary Square, Bradford. There was a representative from each of the Bradford Running clubs along with children from Greengates school, players from Bradford Bulls, Keighley Cougars, Bradford City, Councillor Kris Hopkins, and elite runner Lisa Wilkinson. Photos were taken of various groups and appeared in last Friday's Telegraph and Argus. On October 18th 2009 there will be a 10 mile road race involving 2 loops of 5 miles from Centenary Square,1st loop out to Lister Park and back then out to Bowling Park finishing back at Centenary Square. The Marathon is proposed for October 2010 and will involve running 5 loops, each 5 miles, and running out and back to 5 different Bradford Parks,in reference to the Olympic circles! Runners can partake in a 5, 10, 15, 20 or 26 miles race on the day. The ladies are back! with good wins in the ladies team and lady vets team competitions. The SuperVets had a good win, and we were 4th in the main team competition (could still do a little better ...). Full results, and photos, on www.harrogate-league.org.uk.